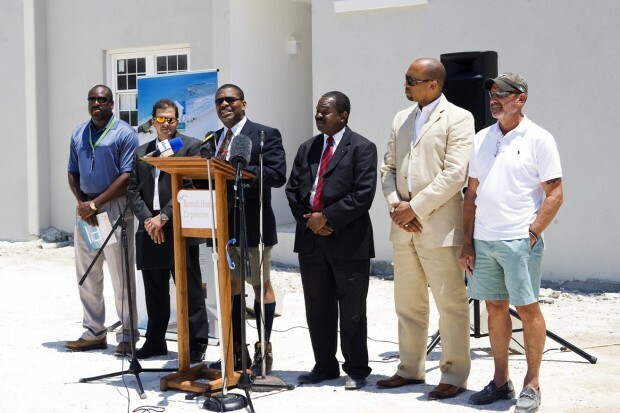 Minister of Environment, Planning and Infrastructure Strategy Walter Roban held a press conference this afternoon [June 9] to update on the progress of the Bermuda Housing Corporation’s Grand Atlantic Development on South Shore, Warwick. The Minister said the units will be available for sale in phases starting in August, with prices ranging from $495,000 for a 2 bedroom home up to $670,000 for an ocean view 3 bedroom unit. The housing development will comprise of 60 two bedroom/one bathroom homes and 18 three bedroom/two bathroom homes. The photo below shows the view from the balcony one of the homes which will be completed and available for sale by August. Pictured below left to right are: Electrical Engineer and Project Coordinator Kennedy Wainwright (Belco); Senior Vice President of engineering for Ascendant Group Michael Daniel; Minister of Environment, Planning and Infrastructure Strategy Walter Roban; Bermuda Housing Corporation General Manager Major Barrett St. Vincent Dill; BHC Project Assistant Manager Blake Lambert; Contractor Gilbert Lopes of GL Construction. Bermuda’s traditional building methods have been utilized for the construction of the first phase condos. Minister Roban said the Bermuda Housing Corporation has already received over 70 expressions of interest from the general public keen to own a home in this development. The Government of Bermuda, in continuing with its mandate to provide adequate and affordable housing for Bermudians, is very proud to announce that the exciting new Housing Development known as Grand Atlantic on the South Shore in Warwick – where we stand today – is on schedule for the first phase delivery in August of this year. The Grand Atlantic project follows the successful Government Housing initiatives of the Loughlands Development in Paget, where 96 families have taken possession of their own homes for the very first time; the Harbour View Development for Lottery winners in Southside, St. David’s where 30 families have moved into their completed homes and a further 56 families will soon take possession of their Lottery dwellings in the Southside Development; and the purpose built Rent Geared to Income (RGI) property at the Perimeter Lane Development in Pembroke East, affording 38 families the ability to rent Bermuda Housing Corporation properties while paying only 25% of their household income for rent. The Corporation has also formulated plans to increase the stock of Rent Geared to Income Properties across the Island. The Bermuda Housing Corporation is continuing to address the needs of the community by engaging in partnerships with other Government agencies such as the Cross Ministry Intervention Team (CMIT) to assist “at risk” families; the Corrections Department in establishing a half way house for released inmates; and the Child and Family Services Department and Court Services to ensure that all Bermudians have safe and adequate dwellings to call home. The Corporation is responsible for managing multiple rooming and transitional houses across the Island to assist those in financial or social distress who are in need of housing assistance. Continuing the trend of providing housing units for Bermudians, at the end of August, 24 (twenty four) Grand Atlantic units will be available for sale by those wishing to purchase their own homes or downsize to an ocean view property. This housing development on the beautiful site of the South Shore in Warwick, will comprise of 60 (sixty) two bedroom / one bathroom homes and 18 (eighteen) three bedroom / two bathroom homes situated in pristine surroundings. Bermuda’s traditional building methods have been utilized for the construction of the first phase condos. The Bermuda Housing Corporation has already received over 70 (seventy) expressions of interest from the general public keen to own a home in this development. The Grand Atlantic Development is bordered by the Southlands Park which is soon to be Bermuda’s newest National Park with access to a beautiful south shore beach. Residents will eventually have full access to Beach and Park areas for their relaxation and enjoyment. In addition, the Government of Bermuda is happy to declare that it is in the process of partnering with Ascendant Group so that the units in the later phases of this development will have a sustainable theme. In the event of a power outage, these units will be self sufficient in terms of basic energy requirements. 54 (fifty- four) of the 78 (seventy- eight) units will have a renewable energy component built into the design. The incorporation of an alternative energy system is in line with the Government’s and Ascendant Group’s stance of recognizing methods of embracing alternative energy for the country and thereby reducing the Island’s reliance on fossil fuels. This initiative will offer new home owners the most reliable, affordable and sustainable energy infrastructure available in Bermuda. The residences at Grand Atlantic will be available for sale in phases. The prices will range from $495,000.00 [four hundred and ninety-five thousand dollars] for a 2 (two) bedroom home and graduate to $670,000.00 [six hundred and seventy thousand dollars] for a luxurious Ocean View 3 (three) bedroom unit. The Government is extremely pleased to have partnered with Mr. Gilbert Lopes of GL Construction and the Grand Atlantic principals to bring this project to fruition and to assist Bermudians who are keen to purchase a home with a grand view of the South Shore. Interested purchasers are invited to contact the Bermuda Housing Corporation for further details. It is my pleasure to introduce Mr. Michael Daniel of Belco who will speak on the alternative energy solutions for the project. A lot of landlords will soon be smelling hell . They were flogging defenseless families for far to long . Renting out glorified horse stables at exorbitant take it or leave it rates . Enjoy the last of your spoils . To those considering buying into Grand Atlantis ,don’t rush for the top floor ,cause that roof will betray you at the first Cat.3 hurricane . Since the Government has decided to flood the market with low cost houses for middle class bermudians, then what the hell happens to the people like myself who either have a decent unit to rent out or to sell????? Thanks to the greedy landlords, everyone will suffer. @ Down n Dirty, your tax dollars were spent to build those units….how does it feel to subsidize the middle class, and turn a profit for the developers???? And what about the MAJORITY of Bermudian who don’t even own their house?! lolol @ low cost, to think that 500-700k you consider low cost housing, still paying between 3-4k per month on a mortgage. It affordable housing not low cost housing, and if Government never made the effort to create such housing who would??? No one. the problem is that I bought a 2 bed 1 bath for 100K more than the government projects. My tax dollar was used to subsidize the these units, which have made my home less valuable…..and people in my wage bracket i.e Mr and Mrs. average working class Joe Public are to benefit….thats F&%Ked up man! I applaud this Government for attempting to do something regarding the affordable housing shortage, do any of you think that the private sector, or those who own large estates would help the public??? You have some people buying these properties to rent for outrageous prices in the hopes an expat will pay their mortgage, which is ironic because that is what helps inflate the market. The customer determines the price of properties, and in our case the customer’s greed helped inflate these prices of homes. The current market is not sustainable for MAJORITY of Bermudians, even what people consider to be affordable is still a struggle for many Bermudians. I am not sure about the average economic demographic of the majority of the people who post on Bernews, but I do wonder at times if they are in touch with the economic situation of the masses. Aren’t their tax dollars doing that? Not when it comes to housing which is what we are currently discussing (I apologize if my point was not clear enough). … all at the taxpayer’s expense. Grand Atlatis…Gilbert Lopes should be ashamed of himself for putting up these horrible condos….but I guess all he is interested in is the money…. Well I’ll be,low cost housing with a view of the south- shore. Hmmm. Nothing wrong with Bermudians having a view of the Ocean – is there?? As the post mentioned, these are affordable housing units, not low housing units. And like a post said earlier, it’s our own greedy Bermudian landlords that heated up the market by charging exhorbent rents because the IB community would pay them. It’s about time the rental and housing market cooled down! Yeah they are not perfect, most projects have issues, but I commend the BHC for setting out and completing the agenda of making sure that working families can own a piece of the rock! I have seen what Mr. Lopes has done at Loughlands. Wonderful work, It would be nice to own water view for $670,000. Congratulation BHC! I hear there are still amazing ready to move-in condos in Somerset priced under 600k. 2 Bedroom 1 1/2 Bath. Your own parking space, storage, granite countertops througout, stainless steel appliances, travertine tile, and central air. Oh and a 2-4 minute walk to the beach. Most of the units have living area downstairs and bedrooms upstairs. Oh and did I mention already installed washer and dryer in each? Wow!!! If interested here is a good person to contact for more information. Let the public also know that there is an ‘age rule” when applying for the mortgage…sounds good how you’ve written it but don’t forget the ‘fine print” ..maybe that’s why they’re still empty!!!!!! age is always taken into account when dealing with mortgages. The US Observer has forgot to mention a few key points that would raise eyebrows for any potential buyer (those of which were taken into consideration when they were viewed BTW). The development of the above mentioned has changed development hands twice and some are incomplete. There are still a number of issues with regard to the legalities of those properties. Why is it, with so much unemployment, there is nothing but expats working 7 days a week up there to build these units. Come on Lopes, why don’t you hire your own, so they can make some money and possibly buy a place! Also, where are the plans for the hotel? How nice…..yet I still can’t afford one. Well at least all these new units and the mass exodus of guest workers will bring down the rents. I have already seen places advertised for rent having their rental price reduced month after month. Pretty soon it will be really cheap to rent. Oh and some of you greedy landlords need to fix up your places for what you want to charge. The complaint by many, including all opposition parties, is that the government has not provided affordable housing for Bermudians. It does and people are still complaining. One thing is for certain, this government is damned if it does and damned if it doesn’t. I disagree, the market has had an upward swing for 30 years…any economist will tell you that this is unprecident. The cooling down of the market was way overdue. Especially for young families and new grads that come from families dont have a homestead or two to pass on (which will soon be the majority of our country). Property would always be expensive in Bermuda regardless because of our high population density. In the past 10 years the prices have risen exponentially.. to unattainable levels for majority of Bermudians.. The market cannot sustain this forever. And as you rightfully stated, many people are not having the luxury of homes being passed down to them. And furthermore, to get a mortgage.. pay $7-8k permonth for 25-30 yrs?!!! I am not sure if Bermuda will be this blessed for another 25-30 yrs, world finance and golbal economies can change drastically within that timeframe. Affordable!?!? for who?! take your head out of the sand! The average Bermudian will never be able to pay $2000.00 pm on mortgage much less $3000.00- $4000.00 unless of course they become ministers. SMH What a joke. Is government going to clear up my negative equity situation when I default on my mortgage? Good idea in principle, but as with most PLP “ideas”..not completely thought through. You still going to discriminate against Bermudians who marry non-Bermudians? you still going to stop me selling to non-Bermudians? Still going to try to manipulate the market? Tell me…how are we paying for all of this? @LaVerne – firstly, the definition of “providing” affordable housing does not mean building units for “sale” at “affordable prices”. I have often heard that everyone has the ‘right’ to own their own home. Which country do you know where this is a true statement? The fact is that no matter what country you live in, there are people that rent and people that own. Government would be better served by building nice, affordable rental units for families to allow them to save their money to eventually buy their own homes in the free market. By building these homes, government is meddling with the free market economy. Think about every middle class person that has purchased an $800k condo…you just single handled deflated the value of their units by at least $200k. So when they need to sell their home if they run into difficulty, then what? And what about middle class people who have have mortgages that factor into rental income that will no longer be there? When those mortgages default, the whole market is affected. The problem is that nobody is buying real estate at the condo end of the market. My bet is that the prices on these units will drop. A great deal for waterfront property. Hopefully some people will take advantage of this. Whether or not this is truly ‘affordable’ as Ms Furbert says – depends on your point of view. They aren’t mobile homes – and they’re still half a million bucks. This government has done agreat job in providing new units for purchase and rental for Bermuda. To deny that, is to deny the truth. From the units at Butterfield Lane, Perimeter Lane, Loughlands, Harbourview Village and now Grand Atlantic, hundreds of Bermudians have been able to own a piece of Bermuda, or begin renting at affordable rents. I wish posters would cease being negative on every issue and at least be objective. To say this government has done nothing for housing is being totally disingenous. I’m afraid of Bermudians don’t see this as affordable they are living in the wrong place. Rather than dumb down, go out and take advantage of the system, get educated, get the jobs and make the money. It is/was out there. Bermuda can either be well off and predominantly middle class, or we can be poor, where few will be able to afford anything. They key is education and a willingness to work. That’s where we have failed, not in housing. Joe you are correct. But many Bermudians don’t even attempt to buy a home since they can’t afford it. At least this is what they think. The fact is, they can’t afford NOT to buy a home. Retirement in Bermuda is all but impossible for middle class people unless you own your home. Start when you are young, sacrifice, instead of buying that fancy car -put the money on a property. Buy the cheapest place there is – you can trade up later. Bermudians need to be educated on this. There is no clear cut answer to buying versus renting. The old adage that you should buy is quickly becoming a thing of the past. Many people are realizing that when you buy a house, it is not an investment as you end up paying a lot more for the house than you you bought it for. The decision to buy is about your priorities in life. If your priority is to give your child a good education, then the extra money should go to that rather than buying a home. Not to mention, what you buy a home for today may be more than what it will be worth in the coming years if things don’t turn around soon(which I don’t see happening due to excess SUPPLY of housing in Bermuda). What you waste in interest money could be close to the same amount you waste renting depending on your mortgage. 1) Do you think it is easy for one to come back home after finshing Uni to get a job? 2) Do you think it is easy for one to come back home after finishing Uni to get a DECENT well paying job? 3) Do you think everyone who goes to University wants to be an accountant, underwriter, or actuary? I can sort of understand where you are coming from, but there are educated hard-working people out there who still find it hard. It is not as clear cut as you think it is. To those who think of this building project as “affordable” housing; consider this: In order to buy one of these units, you will need to get financing from one of the banks. Right now, the banks only offer 80% financing. That’s it. The Home Start Morgage which HSBC wss offering earlier this year (where you could get 95% financing)is gone. I should like to point out that Government has not partnered in this project with the banks in order to make getting a mortgage easier or more affordable. So, if I want to buy one of the cheapest units for $495,000, I need to come up with 20% down payment, or approx $99,000. You also have to tack on the numerous closing costs, like legal fees, bank administration fees, etc. which will normally add to about $10,000 (plus home insurance too). So, if you happen to have about $110,000 lying around, then you are good to go. Imagine how much more the costs would be if you wanted one of the 3-bedroom places for $675,000. For many families paying $2,500 for a two bedroom apartment, plus high grocery costs, etc. this is just not feasible, and certainly NOT affordable. Sad how many people cannot afford a home in their own country. And to think the ‘average’ price for a house is 1.1 million and the ‘average’ price for a condo is approx 800k. I think it’s time for BHC and the Govt to come clean with the people as they had a hard time selling the last phase at Loughlands, as when the banks ceased the 95-100% financing, you had families that did not fit the criteria and not able to purchase these units. Who was able to purchase some of the last phase was B’dians married to spouses of B’dians. With the last of Loughlands being sold during the 1st quarter of 2011. Some of the owners that did purchase are now struggling because of redundancies and a shorter work week and because of this are struggling with the mortgage and maintenance fees. With this said how is BHC/Govt/Lopes going to sell this condo units when the struggled to sell Loughlands! Your points are spot on. Though I don’t understand the need distinguish Bermudians versus Bermudians married to non-Bermudians. You make it sound as if those Bermudians are less deserving or that somehow those non-Bermudian spouses give their Bermudian spouse an “unfair advantage”. Not ever spouse of Bermudian is earning a gazillion dollars in international business nor brings wealth with them. In fact, the average SOB is more likely to be working at jobs and at pay levels equal to the average Bermudian. To think otherwise is just feeding the fear and misconception that somehow these Bermudians married to “foreigners” are gaming the system. But back to your point, yes flooding the market with ‘affordable housing’ that the intended recipients cannot afford is useless. On top of that, you are exactly correct. Any Bermudian who is now in a position whereby they have to sell their home due to financial hardship is being further impacted by the competition govt is bringing about by building these units. I would hazard a guess that this knock on effect would most severely impact the home pricing in the lower end of the market which is most likely to be dominated by the very “middle class” that government is attempting to help, but are in fact not really doing so.